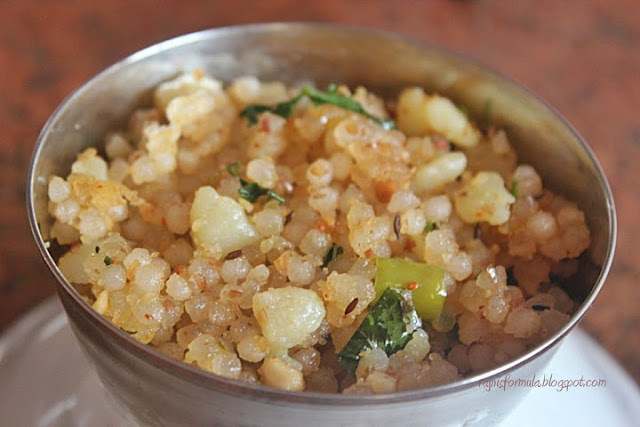 Sabudana Khichdi is an upma made with Sabudana or Tapioca pearls or Sago pearls. It is a breakfast item common to the state of Maharashtra in India. My mom and I used to always wonder why we couldn’t make Sabudana Khichdi as tasty and appealing as our Maharashtrian friends, before we got our hands on the secret tip ;) that is - soak the sabudana only in as much water as it fully drowns in it, neither more nor less (else it becomes sabudana halwa!). Another important point is, always add the Goundnut Powder towards the end (not while frying the potatoes). With time, we mastered the recipe. A very easy breakfast item, gets ready in 20 minutes max! My favourite Maharashtrian breakfast! Edit: Lately I learnt a new technique of soaking sabudana from my paternal Aunt. 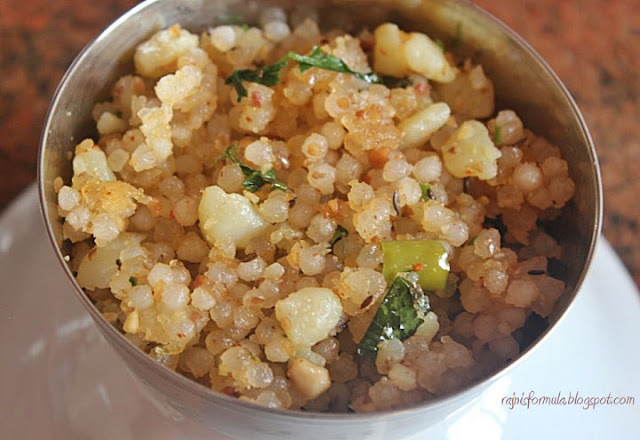 If you are planning khichdi for breakfast, the previous night, soak sabudana in water - no measure. Let it soak for 30 min and then drain all the water. Cover and rest overnight. This method also works equally well. Option 1: Take 2 cups of sabudana in a bowl. Pour water until all the sabudana is under-water! Do not add excess water (only upto the level of sabudana). Soak overnight. Option 2: Soak 2 cups sabudana in water previous night if it is for breakfast. Drain all the water after 30 minutes. Cover and rest overnight. Take oil in a pan. This recipe calls for some extra oil than normal. Put cumin seeds. As they sizzle, add 2 potatoes (boiled and mashed). Add chilli powder, salt, green chillies, curry leaves. Mix well. Add the soaked sabudana. Sabudana will be softer and larger in size on soaking. Mix well and let it cook for a few minutes. Stir in between. You will see the colour/texture of the sabudana changing, becoming slightly translucent. That’s when you know it’s done. Taste and check, to be satisfied! Now add 2 tablespoons of coarsely ground groundnut powder. Cook for a minute. Serve hot and enjoy this easy-to-make khichdi, because it gets ‘rubbery’ as it cools down. If you are not in a position to eat hot, I feel microwaving is better than heating on stove top for the softness. Also, if you have leftover khichdi in the refrigerator, best way to heat is to keep the bowl in a pressure cooker with some water in the cooker - this works best - keep the whistle on, but it need not blow; switch off in a few minutes. The recipe is test run today. onion and ground nuts not added, instead chutney powder of ground nuts was added. the taste was not so good. however it is not due to 'H' effect. Thank u rajamama for the 'test run' :) Onion is not added in this because it is primarily a fasting dish. And 'plain groundnut powder' is an important component! I'm glad the 'H' effect doesn't exist there haha..!